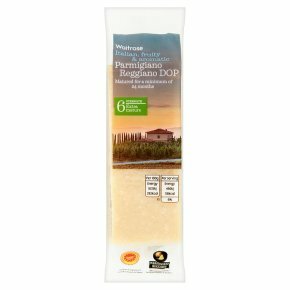 A hard, grainy cheese with a rich, nutty taste and distinctive aroma, this cheese is perfect for use in cooking. Equally delicious to eat with fruit and crackers or sprinkled over pasta or soup. Matured for a minimum of 24 months. Strength 6 - Extra mature …Perfect grated over pasta, soup and gratins. Hand selected for Waitrose for its fruity, rounded character and crumbly texture with a distinctive granular crunch.